President Trump’s fiscal 2018 budget includes significant changes to federal agencies’ missions and functions, including an array of spending cuts and program eliminations. Many of those proposals are likely dead on arrival, with lawmakers on both sides of the aisle already speaking out against various elements of Trump’s $54 billion in discretionary funding reductions. Some of the president’s blueprint, however, will not require congressional approval. Other reforms buried deep in the appendices of the budget could win lawmakers’ approval through legislation likely outside the budget process. 1) Improper payments: The Trump administration suggested it could save $139 billion over 10 years by cutting in half the payments federal agencies are currently doling out improperly. The White House plans to leverage existing tools at those agencies, such as giving the Internal Revenue Service more flexibility to “address correctable errors” and further using Customs and Border Protection’s entry-exit data, to reduce the amount of federal dollars winding up in the wrong hands. 2) Privatize air traffic control: Trump suggested turning most of the Federal Aviation Administration into a non-governmental nonprofit organization, led by stakeholders of the flying industry. Republicans made some progress on a similar proposal last year, with an architect of the plan boasting it would “remove 30,000 people from the federal government payroll.” As efforts have reemerged in recent weeks, several groups representing FAA have voiced their opposition, though the union for air traffic controllers has left the door open to supporting the reform. The White House, noting 60 other countries have privatized their air traffic control operations, said aviation safety responsibilities would remain within the government’s purview. 3) Veterans health care: The president’s budget would add $2.4 billion in discretionary funding for the Veterans Affairs Department to provide care to patients who prefer to receive services from the private sector, a 32 percent increase. It would add an additional $2.9 billion in mandatory funding to extend the Veterans Choice Program, an initiative President Obama signed into law in 2014. Trump suggested reducing certain veterans benefits, such as the payments to those unable to find work due to service-related injuries, to pay for the new care offerings. The president also endorsed reforms to streamline the process for veterans to appeal claims, including by boosting staffing and improving technology. 4) Federal contractor oversight: The Labor Department would consolidate the Office of Federal Contract Compliance Programs by folding it into the Equal Employment Opportunity Commission. The move would “place oversight of federal equal employment opportunity under one roof,” the White House said. The Labor office employs 568 workers. 5) Public land management: Trump is looking to severely limit new federal land acquisition, proposing a cut of the budget for those purchases by 70 percent. He would also open up existing public lands to sale or lease, such as the Arctic refuge and offshore areas for drilling, areas with “low conservation value” through federal land transaction facilitation, and Bureau of Reclamation land transfers to non-federal entities. The administration said this would help pay for a small funding increase at the National Park Service. 6) DHS human resources: The White House previously announced its commitment to funding hiring surges at Customs and Border Protection and Immigration and Customs Enforcement. In its full budget it spelled out plans to boost human resources staff by 30 percent, boosting the chief human capital office’s coffers by 43 percent. DHS said the staffing increase would help attract and retain employees, and “enhance career paths” for them. The department pledged to save money and shorten the hiring process by holding joint recruiting events across multiple components. 7) Renewed Defense promises: Office of Management and Budget Director Mick Mulvaney said at a budget hearing Wednesday the Defense Department would finally be audit-ready by September, a goal lawmakers have long pushed upon the Pentagon. 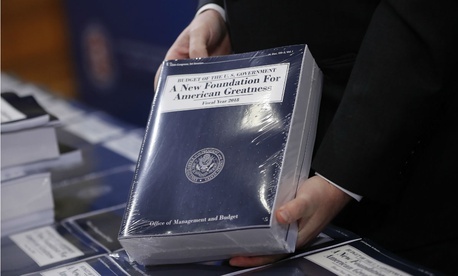 The White House noted efforts under way to accomplish that objective in its budget document. While it suggested dramatic increases in defense spending overall, the Trump administration also brought back a base realignment and closure proposal, calling for a BRAC in 2021. The White House also vowed to continue Obama-era efforts to trim Defense component and activity headquarters’ staffing by 25 percent. 8) National Institutes of Health consolidations: Trump’s proposal to slash 18 percent of NIH’s funding has received blowback from both sides of the aisle, and in a recent spending bill Congress actually agreed to increase the agency’s spending level by $2 billion. Still, NIH could see some tweaks to its operations. The president said the Agency for Healthcare Research and Quality -- currently its own component within the Health and Human Services Department -- should be consolidated into NIH and proposed cutting the Fogarty International Center entirely. 9) State consolidations: The White House proposed big cuts at the State Department and U.S. Agency for International Development, including by streamlining their various efforts to provide food aid, emergency assistance to refugees and economic development. The array of programs currently addressing those categories would be folded into three distinct funds, which the administration said would “increase effectiveness in programming.” The budget zeroes out, for example, the $2.5 billion Development Assistance Fund. 10) SSA hiring reform: The Social Security Administration is looking to place all new administrative law judges on a one-year probationary period. The change, the administration said, would ensure performance at a “satisfactory level.” Mulvaney specifically cited the change at a press briefing Tuesday when noting how the administration will crack down on improper payments. 11) Restructuring CFPB: Trump is looking to restrict the Consumer Financial Protection Bureau, a goal of congressional Republicans since the agency was created in 2011. The White House said the restructuring would refocus CFPB on “enforcing enacted consumer protection” while reducing its “regulatory impositions.” It would also subject more of the agency’s funding to the annual appropriations process.